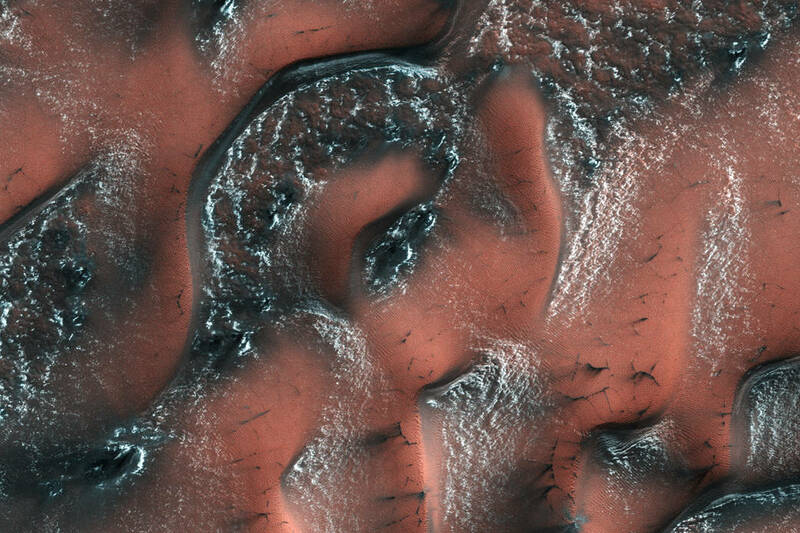 August 24, 2017 – It was spring in the Northern hemisphere when this image was taken on May 21, 2017, at 13:21 local Mars time, by the High Resolution Imaging Science Experiment (HiRISE) camera on NASA’s Mars Reconnaissance Orbiter. Over the winter, snow and ice have inexorably covered the dunes. Unlike on Earth, this snow and ice is carbon dioxide, better known to us as dry ice. NASA’s Jet Propulsion Laboratory, a division of the California Institute of Technology in Pasadena, Calif., manages the Mars Reconnaissance Orbiter for NASA’s Science Mission Directorate, Washington. The HiRISE camera was built by Ball Aerospace and Technology Corporation in Boulder, Colorado, and is operated by the University of Arizona. Lockheed Martin Space Systems built the spacecraft in Littleton, Colorado, and collaborates with JPL to operate the spacecraft.